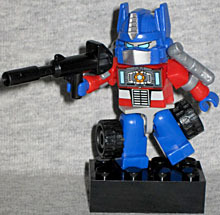 In 2003, Hasbro introduced their "Built to Rule" toys, low-rent Lego knockoffs produced in-house. The toys were terrible and the line folded within a year, mourned by no one. Apparently not willing to let a bad idea rest in the trash heap it so rightfully deserved, Hasbro is trying again, this time with Kre-O. I am Optimus Prime. I do not care for the hijinks of the other Kreon robots. It is our responsibility to ensure that all brick-made beings are able to live in freedom. I do not have time for pranks. Sending Bumblebee on missions so I can get some work done instead of worrying about whose bricks he'll rearrange next. To defeat the Decepticons and retire somewhere an idling truck will be accepted. I once had a cyberdog named Magnus. He was great. 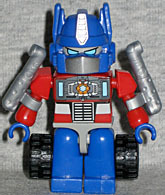 Hasbro introduced Kre-O at BotCon 2011, giving away an exclusive Optimus Prime available there and nowhere else. Oh, except that the figure was accidentally included in the first shipments of the real Optimus Prime set. And they gave it away at SDCC. And it was a freebie included with some orders from Hasbro Toy Shop. But yes, it's exclusive to BotCon! The figure is sold in a rectangular red box with eight cirles embossed on the top - a pattern meant to suggest a 4x2 block. 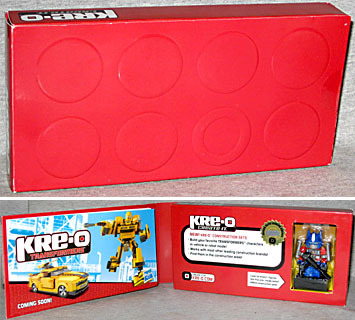 The front hinges open to reveal two things: first, a catalogue of the first series of Transformers Kre-O releases; second, that about 75% of the packaging is just wasted space, since the figure is just jammed off to one side and the rest is as empty as the meeting of the Skids and Mudflap Fan Club. Prime is held in a plastic clamshell rubber cemented into the tray. Since the ends of the box are glued shut tightly, the only way to get him out is pull him straight out the front. 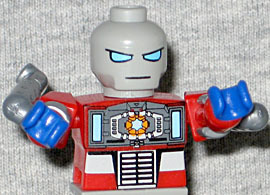 The Kre-O figures, which are known as Kre-Ons, follow the Lego minifigure model more closely than the Minimate model. The base body is just over 1⅝" tall, though Prime's helmet pushes him a little higher. The articulation is better on these figures than on Lego's though: you're familiar with how a Lego minifigure moves at the Big Five plus wrists, and they're all swivels? Well, a Kre-On has swivel joints at the neck, wrists and waist (yes, waist, so he's already one up on the Legos), plus balljoints for the shoulders and hips. Those small changes mean a lot more fun poses. Prime is a mixture of paint masks and unique molds. For instance, the smoke stacks on his arms and the tires on his legs are all separate pieces, just like his helmet. The details on his chest and the face behind his mouthplate? All tampographed on. It actually strikes a very nice balance between specific and generic. The bulk of his body is molded in color: he has a red torso and arms, blue hands and legs, and a gray crotch. The thing that makes this figure an "exclusive," wink wink, is the exposed Matrix of Leadership painted on his chest; the normal version is meant to have the usual windshield. The figure includes his Ion Cannon, which he can hold in either hand. They also threw in a black 4x2 brick for him to stand on, which means we get an idea of what the actual blocks will be like. The plastic is sturdy, very much like real Legos. They're apparently made in Korea and China by a company called Oxford, and Oxford has created some top-notch Lego knockoffs, here, and the two brands will be able to integrate. Optimus Prime is a fun little figure, and if Hasbro were selling these Kre-Ons by themselves, instead of in packs with big, expensive building sets that look pretty underwhelming, I'd get the whole range. This entry was posted in blog exclusive review, BotCon, Hasbro, Lego, SDCC and tagged BotCon 2011, Kre-O, Minimates, SDCC 2011, Transformers. Bookmark the permalink. Actually, at TFCon in Toronto last week, a Hasbro Canada rep apparently said that they'd be selling the Kre-Ons seperately at some point in the future. Hey, if Lego's doing it, why not? I picked up the standard Prime & Bumblebee Kre-O brick sets. Both of them were fun to put together. Neither the robot mode or vehicle modes are spectacular, but I think they're a little better than their "BTR" counterparts (I never collected those). Lego Transformers its a real stretch in concept, but in a world where Marvel and Star Wars Transformers crossovers exist and we've gotten Optimash Prime and "Softimus" Prime (the transforming plush doll) I think there is room for a Lego-based Prime. I have no intention of buying any of the deluxe sets for the little Kreon Transformers. I hope they release them separately at some point in time. I'd buy the whole lot if thats the case. I really, really want the Megatron set for the Megatron and Shockwave Kreons. But for the life of me, I can't justify the $30 price. These sets seem to be regularly going on sale for 20% at stores like Target and Toys R Us, so I would just hold out and wait. These little figures are great and I love adding them to my transformers collection, but the price is ridiculous. I just go to ebay where i can get them for all under 10 bucks each. much easier that way. Ten bucks? Oh hell no. I'd happily pay $2.99 ea. and pick up all or most of 'em. I'd begrudgingly pay $3.99 ea. and pick up a few of 'em. I"d pay $4.99 for Optimus, Megatron, and maybe Soundwave but that'd be it. I wouldn't pay any more though. I don't think LEGO Transformers is possible since Hasbro has the license for TF. I think these Cre-On mini figs are pretty cool. I am really tempted to pick up a few boxes of Cre-Os for the little guys. But the building blocks are kinda lackluster. Starscream I think is the only pack that I like both the mini fig and the building vehicle/robot. The Cre-O idea reminds me a lot of the C3 Minimates line. 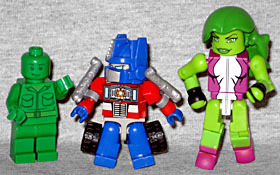 While the designs were great for C3, the fact that the minimates had to be packed with a building blocks design made it expensive for collectors to support. I bought Megatron for Megatron and Shockwave kreons but I have to say they ended up being only half the fun, the sets are involved as Transforming any transformer, although any Transformer that takes 60 minutes to change isn't going to get too much play, but aside from the low arms, it's totally a fine robot and totally zen to get into the rebuilding process. I have to admit, the Starscream looks nice. The Prime big prime is pretty swank too. I'm not paying $30+ for those sets tho. I'm happy with the standard Bumblebee & Optimus, they're what like $7.99 and are a lot of fun to convert (and you can do it in less than five minutes!). I'm contemplating picking up the Mirage set. I like the idea of the smaller sets, but the lack of a Kreon is really disappointing. I still can't believe Hasbro made normal HUMAN Kreons, who wants Jazz and a car racer when you could have gotten like Jazz and Grimlock instead? Though if they make a $50+ Unicron, I'm so there. After checking out this review, it's funny to see the first comment stating that a rep said they would some time in the future be selling just the kreons. So glad they did, I never would have bothered with kreo transformer merchandise otherwise. Now after getting Galvatron, Sunstorm, and Spinister from the first wave of microchangers I am addicted and totally stoked for the next waves from what I saw of pics from sdcc 12. Can't wait for combiners!